As you receive this letter in March it will bring you up to date on our missionary visits completed in February. We praise God for His wonderful help and for your patience. Starting with a well worn 1978 Ford pickup and a Bible under my arm, I obeyed God as He plainly showed me His will to carry on the call He had given me. It is “story book” the way God provided and directed, adding equipment and personnel to follow His bidding. I have done my best to walk through the many doors He has opened to me. How I praise God for His goodness and thank Him for the wonderful Teammates like you who have helped bring it all to pass. Now at last we have caught up on our newsletters and hope to have one in your hands each month that gives you the report and pictures of the preceding month’s mission visits to the reservation Indians. We learned that to IGNORE the facts does not CHANGE the facts. That if you plan to get even with someone, you only allow them to continue hurting you. That if you harbor bitterness, happiness will dock elsewhere. That it’s best to keep your words soft and tender; you may have to eat them. The only survivor of a shipwreck was washed up on a small, uninhabited island. He prayed feverishly for God to rescue him. Every day he scanned the horizon for help, but none seemed forthcoming. Exhausted, he eventually managed to build a little hut out of driftwood to protect him from the elements and to store his few possessions. One day, after scavenging for food, he arrived home to find his little hut in flames with smoke rolling up to the sky. He felt the worst had happened and everything was lost. He was stunned with disbelief, grief, and anger. He cried out, “God! How could you do this to me?” Early the next day, he was awakened by the sound of a ship approaching the island. It had come to rescue him! “How did you know I was here?” asked the weary man of his rescuers. “We saw your smoke signal”, they replied. It’s easy to get discouraged when things are going badly, but we shouldn’t lose heart because God is at work in our lives…even in the midst of our pain and suffering. Remember that the next time your little hut seems to be burning to the ground. It just may be a smoke signal that summons the grace of God. Why lemon juice is made with artificial flavor, and dish washing liquid is made with real lemons? Why there isn’t a mouse-flavored cat food? Why they sterilize the needle used for lethal injections? Why if con is the opposite of pro, does Congress mean the opposite of progress? Friday morning, February 19th, the prayer band met for prayer breakfast. (How grateful we all are to the residents of the condominium complex for the use of their clubhouse!) The prayers of the men lifted this old missionary and his brother, Les Phipps, up in prayer and sent us on our way in the Big Rig to finish loading the trailer at Othello, WA, with over 10 tons of apples, potatoes, and onions given to us by Thirsty Acres Ministries. Many years ago, Bro. 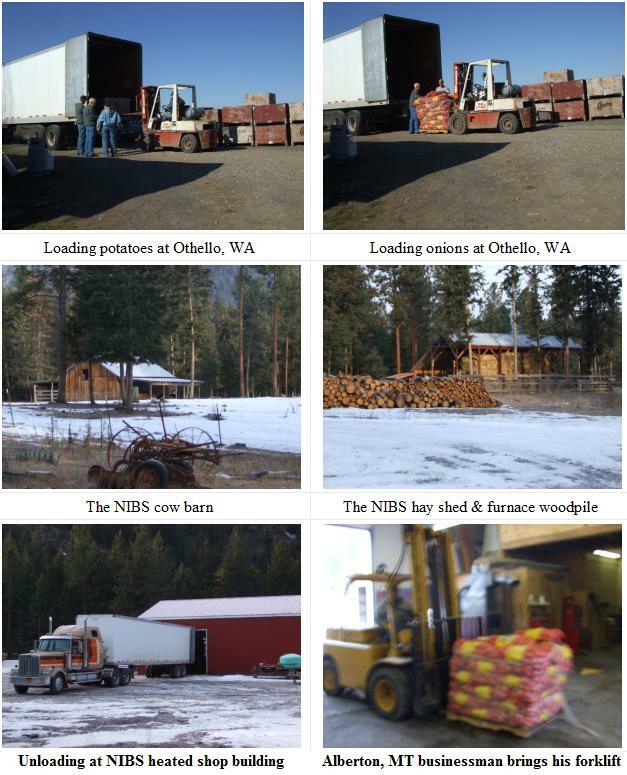 Don Butcher started supplying us with food, and the work has grown and reaches many with its fine leaders and their dedicated labors. Bro. Earl Lee is now the Agape Food Bank pastor, assisted by Thirsty Acres Ministries. Don Butcher. Let us pray for this fine ministry that is such a blessing to so many. 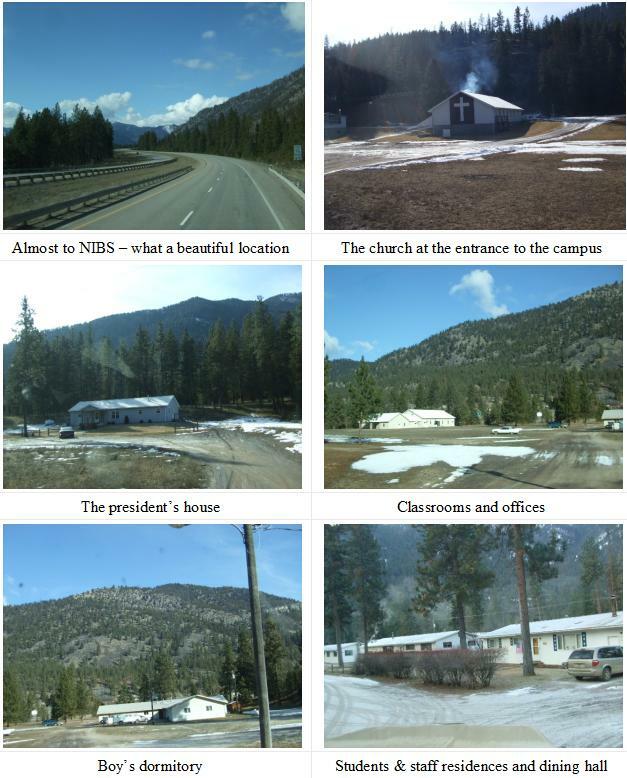 What a beautiful location God’s hand created and He knew when he finished it, that centuries later, He would order and ordain Northwest Indian Bible School to carry on His work to the First Americans. To all of the many who labored to place it here, the school is affectionately known as “NIBS”. Eternity alone will reveal all the souls that have been won, hearts established in righteousness, and the good that has been done on this campus by dedicated men and women of God as they preach and teach young Indian men and women. What a privilege and delight to be a part of it with our prayers and resources! 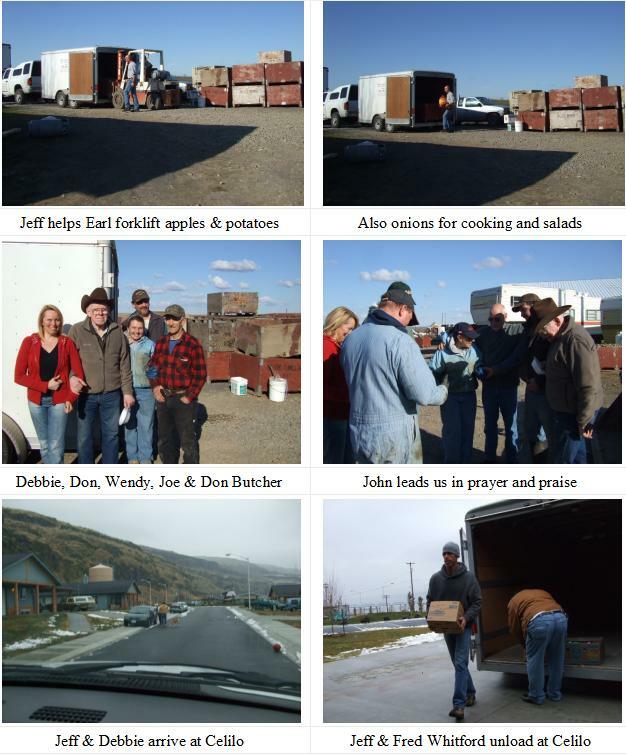 The second team, Jeff Phipps, and his friend, Debbie Casey, were also at the prayer breakfast and tailgated the Big Rig to Othello to finish loading with potatoes, apples, and onions for the outreach to Celilo. While the men loaded and labored, Debbie played the part of “nurse maid” and took old Bro. Don’s arm to steady him on his wobbly legs as he posed for pictures, prayed, and gave thanks to all who labored and made their visit such a success under God’s great hand. 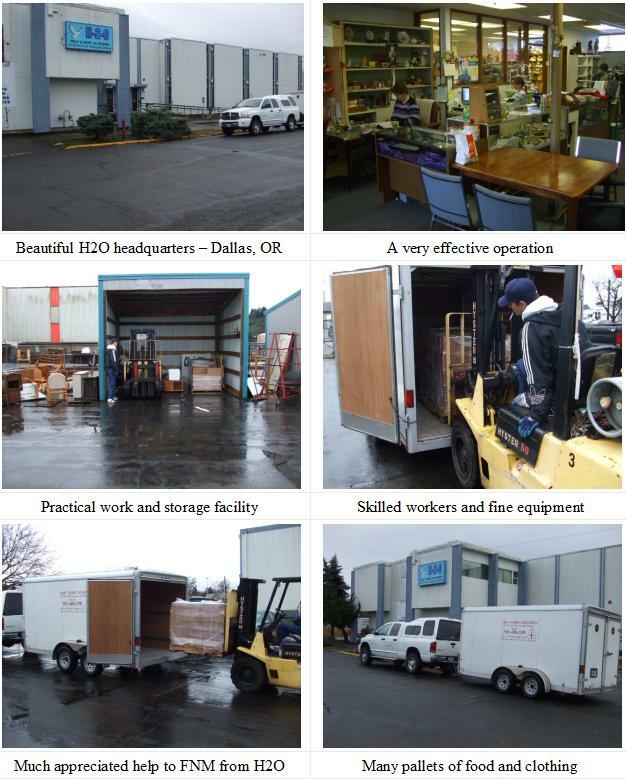 The Big Rig headed east and the second team hurried back west to minister to the needs of our Celilo friends. Here our point persons, Fred and Karen, welcomed them. This Christian couple expressed their thankfulness for all God is doing on their behalf through Christians like you, Teammate. How we wish you could have been there to feel the depth of their gratitude. Help To Others, known as H2O, is a charitable non-profit organization that was founded 27 years ago in a backyard garage. Eight men gathered donations from neighbors and handed them out with a sack lunch to people in need. The ministry has grown and is now in their 3rd building which is beautiful. Their ministry has 3 outreaches: a thrift store which is self-sufficient, a Food Box ministry that feeds a family for 5 days once a month, and the Helping Hands ministry which provides 2 full outfits for each member of the family plus dishes, linens and other household items. This great work is led by a board of directors with Lina Delouch as manager and Janis Wheeler as assistant manager. We thank them and praise God for their help to us!